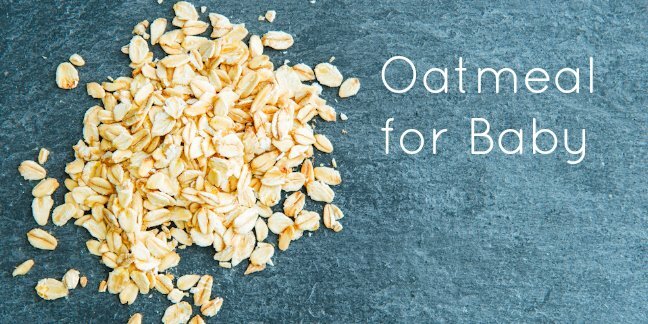 When can my baby eat Oatmeal and Oats? Homemade Oatmeal cereal and porridge is fine to introduce to your baby from 4 months of age. Please remember that the current recommendations for starting baby on solid foods is 6 months of age. Oatmeal cereal may be a better starter cereal than rice as it is less constipating and many babies prefer the taste of oats over rice cereal. Oats are high in fiber, calcium, protein and even some B vitamins. Steel cut oats are slightly healthier and more nutritious than rolled, quick cook or instant oats. Steel cut oats retain the most nutrients because they are not highly processed, but take approximately 11-25 minutes longer to cook than their instant counterparts. Steel cut oats are also referred to as pinhead oatmeal in the UK. Also contains small amounts of zinc, manganese and copper. The EWG does not rank grains in its “dirty dozen” food list so buying organic oatmeal is a personal choice. Whole grains may be stored for several months in a cool dry place. If the temperature becomes extremely warm in your home, you may wish to store the grains in the refrigerator. Milled whole grains, such as rice flour, whole wheat flour, oat flour and the like, should be stored in an air tight container and preferably in your refrigerator. You can store them in a cool dry place however ensure that you check on the status of the grains if you use them infrequently. When grains are milled, the natural oils that come from the grain may become rancid without refrigeration. When purchasing any type of milled whole grain, it’s always best to buy smaller quantities to ensure that your whole grains are used prior to them going rancid. Follow the same storage methods for any rice powder, oat powder, barley powder etc. that you have ground (milled) for your homemade baby cereal. You should store it in an air tight container, in a cool dry place but preferably in the refrigerator if your home is warm. You may use a crockpot, a rice cooker or the good old standby method of pot and water. If your little one needs a finer, smoother texture you may want to skip the crockpot and rice cooker as you will need to puree the already cooked oatmeal. This may or may not turn out to be pasty and unedible. When cooking the “oat powder” for homemade baby cereal, use 1/4 to 1/3 cup of powder per 1-2 cups of water – more or less as you see fit. The key is to whisk whisk whisk as you are cooking to avoid clumping. Step 1: Bring liquid to boil in saucepan. Add the oatmeal powder while stirring constantly. Step 3: Bring mixture to a slow boil. Simmer covered, checking frequently, until apples are soft and oatmeal is cooked. Add pureed fruits and vegetables to baby’s homemade oatmeal cereal as your baby likes. Step 6: Break the Oatmeal Scramble into small pieces that your baby will easily manage and chew. You can also offer up a fruit puree as a dipping sauce. Fruits, vegetables, yogurt and meats are all good foods to add and mix with oatmeal homemade baby cereals. Place 2 cups of Quick or Old Fashioned Oats into one leg of a nylon stocking; close open end by tying a knot. Place stocking under faucet; turn water on to full force, using warm water at a comfortable temperature. When finished filling tub, “swirl” stocking back & forth through water 5 or 6 times. Lift stocking above water and wring to squeeze water and starch out of stocking. Discard stocking — do NOT reuse. Soak in tub as recommended by physician or for 15 to 20 minutes. Gently pat dry. Use once or twice daily, or as directed by physician. FOR INFANTS: Use 1/3 cup and follow instructions above. Soak infant (in infant bath tub) for 10 minutes or as directed by physician. Place 1 cup Quick or Old Fashioned Oats into food processor or blender; grind oats into finest powder possible. Turn water on to full force, using warm water at a comfortable temperature. Slowly sprinkle oat powder under running water. Stir water thoroughly to avoid clumping or settling. Soak in tub as recommended by physician or for 15 to 20 minutes. Gently pat dry. Use once or twice daily, or as directed by physician. Nutritious and tasty, oatmeal baby cereal is easy to make can be combined with any food that your baby likes. Oats are not known to be highly allergenic however they may contain traces of gluten. Quaker Oats offers the following suggestions for mixing Oatmeal with yummy foods – please make sure YOUR mixes are age appropriate, with allergens in mind, for your baby.